At Christie’s Auction House in NYC last week, Lady Gaga dropped $295,000.00 on three pairs of worn Alexander McQueen shoes! The shoes ironically were worn by the star herself in her Bad Romance video and on the Red Carpet, but she never owned them, until now. 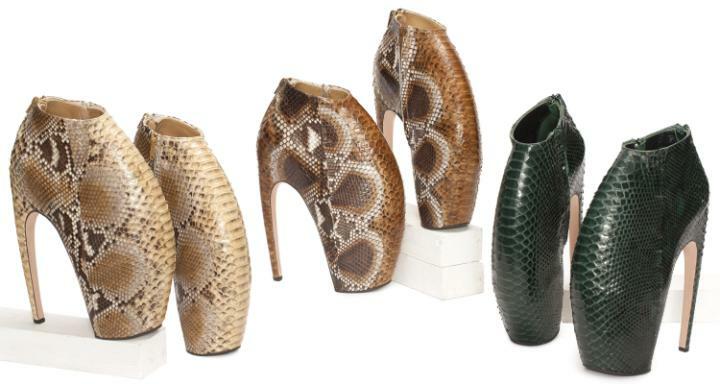 The armadillo soles were handcrafted in Italy from wood and python skin and have become an iconic look for the pop star. It must be nice to drop over a quarter of a million dollars on crazy-couture shoes. And no, I’m not jealous (fingers crossed behind back). Although I do have to say, it wasn’t a completely irresponsible spending spree; the money raised from the auction went to benefit UNICEF’s relief efforts in Nepal. Thank you Miss Gaga, that was very Lady-like of you. She considered the late designer a friend as well as a tremendous source of inspiration and support. Lady Gaga released this personal statement to V Magazine describing her cosmic revelation of the shoes and her personal relationship with Alexander McQueen. I really do believe what’s meant to be will always find a way, just like these shoes found their way back to Lady. So, trust in the mystery of your journey and believe in the power of your dreams. The first pic is of the coveted shoes. The second pic is Lady Gaga wearing the shoes in her Bad Romance video. The third pic is an Instagram photo Gaga posted from her New York balcony after she brought the shoes home. The fourth pic is of her and her fiancé Taylor Kinney on their way to her performance with Bono.